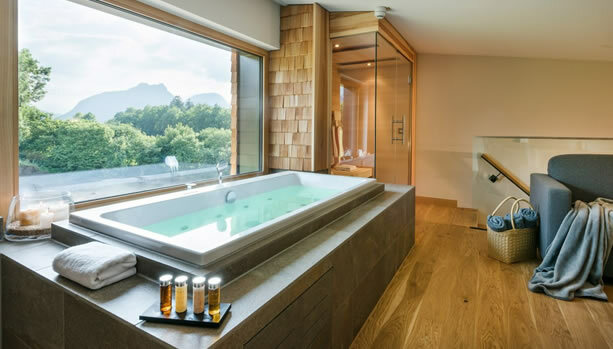 After a one-and-a-half-year of reconstruction, the historic Klosterhof in Bad Reichenhall, Bavaria (close to Salzburg) was reopened as a luxurious Premium Hotel & Health Resort in 2016. 65 Panorama Rooms with stunning mountain views, Spa Lofts with exclusive private whirlpool , the 1500 sqm Spa with its own health centre , a new culinary concept “New Alpine Pleasures” in different taste variations, as well as the artwork and design reflected in each corner and every room of the hotel await you at the romantic ****S design hotel Klosterhof. The time of pregnancy is something special for every woman – always exciting and sometimes exhausting. To recharge your batteries for the birth and the upcoming baby time, to let go with a special massage and to enjoy the feeling of lightness while floating, expectant mothers can enjoy the Babymoon in the Hotel Klosterhof. Deeply relaxed and culinary spoiled – of course, our kitchen follows the dietary rules for pregnant women – baby in the belly and parents-to-be are all happy.